After tucking its USB cable neatly to one side, my gleaming mechanical keyboard was lowered back into its box like a sinking sea vessel accepts its watery fate. Having only owned the Corsair Vengeance K65 for six days, you might call my decision to return it premature. But almost a week of hammering at its keys like a destroyer of tiny ants trying to do an impression of the world's most annoying broken metronome has sapped the joy of typing out of me. Mechanical keyboards are infamous for having louder keys than traditional membrane keyboards, but for several reasons the K65 and I just didn't click. 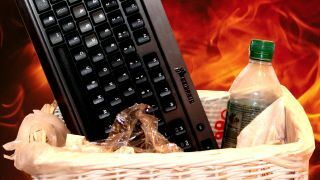 I became interested in mechanical keyboards after reading an article by TechRadar Associate Editor Kevin Lee earlier this month that detailed how MSI designed the GT80 Titan: the first gaming laptop to pack a mechanical keyboard. The MacBook Air's keyboard is awesome - I've happily typed hundreds of thousands of words on it in the last four years, but this ringing endorsement of mechanical keyboards from the gaming community made me wonder what all of the fuss was about. Could the mechanical keyboard tech popularised by IBM's Model M keyboard in the early 1980s really be preferable to what's inside today's modern notebooks? My first consideration was which of the various Cherry MX switches to go for. Modern mechanical keyboards possess different actuation points (the distance a key is depressed before it registers) depending on the switch type. Popular switches include Blue, which are suitable for day-to-day typing, Brown (for typing and gaming) and Red (also for typing and gaming). Less common alternatives include Green, Clear, and Black. Being a frequent typist and gamer, I settled on the K65 because of its Cherry Red MX switches, futuristic design and compact nature. Many mechanical keyboards come with numberpads, which I didn't need, and it was more important to be able to slip it into a bag for easy transportation. Early signs weren't promising. Going from the MacBook Air's low wrist position to the K65, which raises the keys by 2.5 centimetres at its highest point, it became apparent that I would need a wrist rest. Typing became much more comfortable with one, but my accuracy had taken a massive hit compared to the MacBook Air. The K65 required substantially more effort to hit the right keys, and my high error rate was such that I had to convince colleagues and friends I hadn't converted to LOLspeak. Moreover, after three days I began to develop a slight throbbing pain on the underside of my right wrist that worryingly felt like the early stages of RSI. Curiosity usually kills the cat, but here it was killing my arm. By day four, my enthusiasm was well and truly on the wane. My typing rate hadn't improved and the errors were still frequent. My wrists ached. I must have been doing something wrong, I thought. Was my technique to blame? I trawled forums in search for answers. A frequent topic of discussion was "bottoming out", a term used to describe the act of pressing a key all of the way down. The theory is that because Cherry MX switches provide feedback when the actual point is hit, you don't have to depress keys all of the way down to make them register. As such, hitting the actuation point rather than bottoming out was the key to speed and accuracy according to online users. I gave it a shot. Sometimes I would strike the keys too softly and they wouldn't register, and other times I would literally bottom out with a vengeance. My typing speed slowed still as I concentrated harder on the technique. I adjusted my wrist mat. I sat up straight. And on day five, I decided enough was enough. I had got to the point where instead of typing naturally, I was overly thinking the process. Admitting defeat, I didn't even bother trying any games. What was the point if it failed my basic typing needs? The saddest thing is that the Corsair K65 Vengeance is a beautiful keyboard that from the first touch feels a step up (or three) to the identikit membrane ones that come with basic PC setups. I wish I liked it. If you prefer clackety, heavier keys over shallow laptop-style ones, I have no doubt that you would bag a keeper in the K65. Perhaps MX Reds just weren't for me. Blues, perhaps? Curious, I siddled back to my MacBook Air for the first time in six days to open its lid, position my hands on the keyboard and wrest my rist on its aluminium base - and it was glorious.